Engineers in Action, a 501(c)3 based in Tulsa, Okla., joined the #GivingTuesday movement today with a twist on the well-known hashtag and a call to donate as little as $2 on Nov. 29. 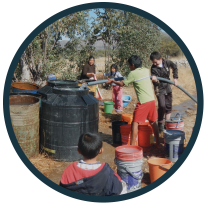 “With how often people are known to walk in a convenience store and lay down $2 for a fancy bottle of water, we thought it would be the perfect opportunity to highlight what a huge impact that mindless $2 expense would make in the rural Latin American communities we serve,” said Rod Beadle, executive director of Engineers in Action (EIA). The organization, which recently launched its Twitter handle @EIA, will utilize a social media strategy on Twitter and Facebook.com/EngineersinAction1 to raise awareness with new audiences during the global day of giving that follows Black Friday, Small Business Saturday and Cyber Monday. 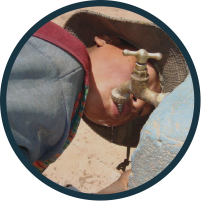 Engineers in Action works in rural communities to provide the leadership, labor and materials necessary so that communities have easily accessible water that is safe to consume and sanitary to utilize for every day tasks. The organization also works on projects to enhance the cognitive development children and focuses on bettering the individuals they effect by providing ongoing support and continually building relationships. 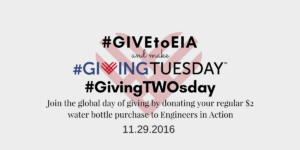 EIA’s #GivingTWOsday campaign on the globally-recognized #GivingTuesday day of giving is an opportunity for individuals who don’t typically make donations to non-profits to get involved in philanthropy, hopefully with a donation to EIA. To make a #GivingTWOsday donation, go to bit.ly/GivetoEIA. To learn more about EIA go to EngineersinAction.org.